The following is an unpaid, untrue advertisement for the Zero G spice rack, which, incidentally, is real $44 product at Yanko Design selling under a slightly different name. YOU HAVEN'T TASTED SPICE UNTIL YOU'VE TASTED IT IN ZERO G!! 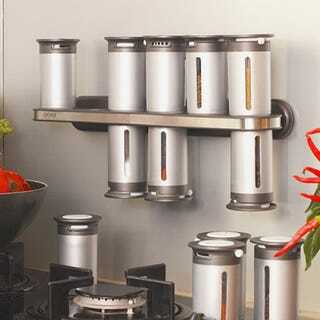 THE CANISTERS STICK UPSIDE DOWN!!! THE TASTE IS OUT OF THIS WORLD!!!!! "Hey mom, this saffron just turned me into an astronaut!"